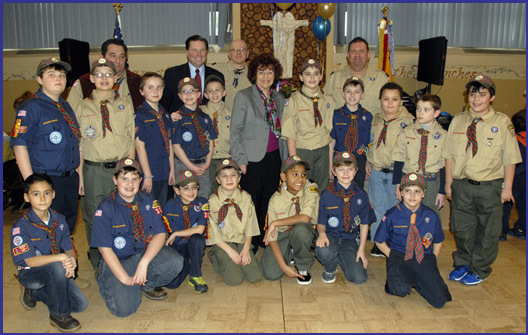 Presiding Officer, Legislator Norma L. Gonsalves attended Cub Scout Pack 362’s annual Blue and Gold Dinner held at St. Raphael’s Church in East Meadow. The Blue and Gold Dinner is an event to celebrate the scouts “bridge” from Cub Scouts to Boy Scouts as they continue their progression through the Scouts organization. Pictured: Presiding Officer Norma Gonsalves; Assemblyman Tom McKevitt; Den leaders Tony Iadevaio and Frank Maniscalco; and the Scouts of Pack 362.